The first generation of the remarkable Mistral rear dèrailleur, shown above, showed that Ofmega maintained their radical approach to innovation. The colour matched rear dèrailleurs came in black, white/grey, blue (Squadra Azzurra), pink (Maglia Rosa). The last two were named after important cycling artifices (to Italians). There may have been other colour forms. According to several boxes that have been seen, the first generation dèrailleurs did not come in yellow (the Maillot Jaune dèrailleur). All of these components used a high-strength "composite" for their bodies, their upper jockey-wheel cage and the jockey wheels themselves. The composite appears to be a high grade thermoset plastic. Although the plastic has lasted very well (with only one report found, so far, of a rear mech breaking), the colours are not fast and will degrade in sunlight. 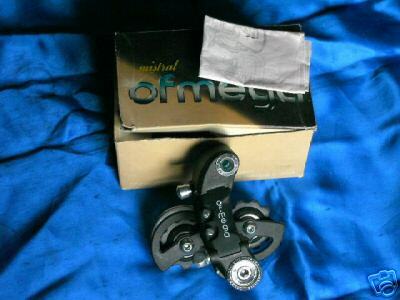 The patent for the Mistral derailleur was applied for in 1981 (patent number IT 195001 B; granted in 1988). According to th patent, it was invented by Dino and Mario Perroti. However, Bruno Giardino's design house seems to have been involved. Michael Sweatman's "Disreali Gears" website has a copy of the Giardino website showing a prototype dèrailleur. It is still shown on the company's website at http://www.giardinodesign.com/og/1og.htm. However, it claims that they were designed in 1984, which is two years after they first appeared in the Ofmega catalogues. This may be a typical designer communications problem or hint at when the design change to the second generation. The derailleur shown on the Giardino website shows one interesting feature; the logo is printed running down the leading side of the top of the parallelagram, not running down the middle of the top plate. All of the examples of the derailleur circulating that have been seen have the logo in the middle. The protoype has a very interesting jockey-wheel cage. It is not found on any production model; only the white model has a cage that is even slightly similar. The rear derailleurs come in two distinctive forms: first generation (as shown above; with all stainless steel small parts, with no cable tension adjuster) and second generation (with alloy small parts and with a cable tension adjuster). The first generation derailleurs tend to have alloy or stainless steel jockey wheel covers, whereas the second generation's are white plastic. When the shift between the two generations happened is not clear (see the main Ofmega Mistral article on Ofmega's inability to date most things). Whether the alloy bolts and screws could be purchased as an upgrade is not clear but possible, as Sintesi bolt sets were available. Interestingly, most of the pink mechs seen are second generation and most blue are first, whether this is an oddity of sample sizes or something more manufacturing based is not known. The Yellow and White colour forms are very rare, as are the coloured forms of the Sintesi pedals.